It’s Christmas and a good time to visit Tiny Tim. The visit compares Atlantic storms in two periods and uses Tiny Tims to help in the comparison. One is a modern period (the last twenty years, 1988-2007). This is a period of good (and ever-improving) detection tools, like advanced satellites, improved recon devices, denser buoy networks and so forth. The modern period also matches the 1988-2007 list of Tiny Tim storms. Tiny Tims are storms so weak, small, remote and/or short-lived that there’s no record of ships or land experiencing storm-force winds, yet they were classified as tropical storms. By historical standards these modern Tiny Tims would have been regarded as depressions or disturbed weather, not tropical storms. The second period is 1925-1944, which immediately precedes the start of aircraft recon and has reasonably similar AMM/AMO characteristics to the modern period. I’ll call this the “pre-recon” period. This pre-recon period had only ship and landfall information for knowledge of the existence and strength of tropical cyclones. It also had what I describe as little more than educated guesses about a storm’s strength, mainly based on ship data which was often sparse and distant from the center of the stronger storms. The weathermen of the day were detectives, as are those who reconstruct storm history, and they made the best of what little data they had. Why look at 1925-1944? The 1925-1944 period was at or near the prior peak in Atlantic storm activity, so an examination of that period could be useful in comparison to the present elevated activity. The data I use are the “ACE” values of the individual storms. ACE is a function of storm duration and intensity. The quality of storm ACE data for the modern period is pretty good but it is of highly questionable quality for 1925-1944. That cannot be emphasized enough. It’s important to not put too fine a point on any comparison. 1. 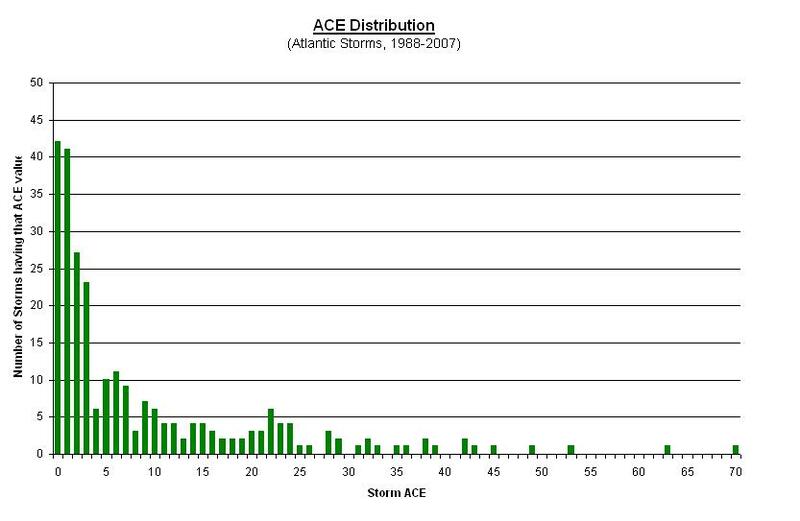 What do the distributions of storm ACEs look like in the modern era and the pre-recon era? How do they compare on a normalized basis? 3. How do they compare on an absolute basis? 4. How do the storm counts compare if Tiny Tims are removed from the modern period? 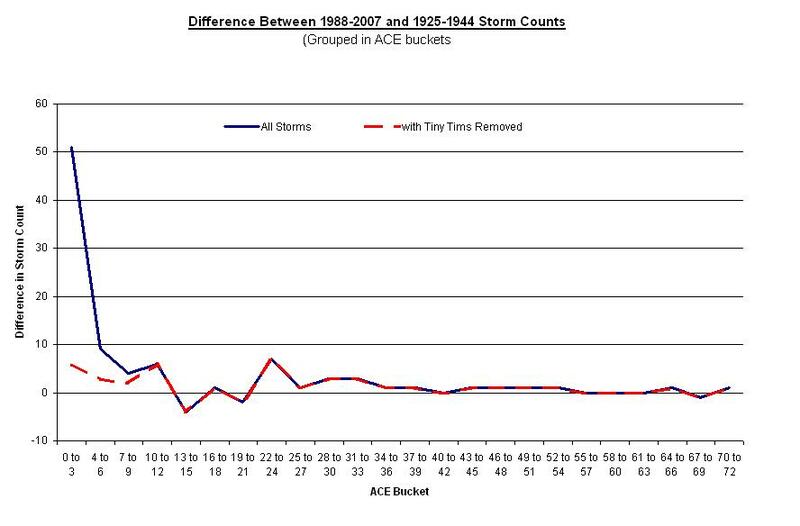 The figures below are bar charts which show the total count of storms in each ACE value (0 to 1, 1 to 2, etc). The overall visual impressions are (1) that the bulk of storms have fairly low ACE in both periods, (2) that there are more storms in the modern period than in pre-recon and (3) the pre-recon period seems to have an odd shortage of the weakest (ACE less than 1.0) storms. On a normalized basis, the distributions look similar but with a couple of notable differences as shown below. The pre-recon “shortage” of very weak (0 to 1 ACE)storms is notable on the left side. Also, the pre-recon distribution seems to tail off more slowly (“fatter” around 15 and “thinner” around 30). Perhaps that is real or perhaps it reflects better ability to measure extreme events in the modern era or perhaps it’s a combination of effects – no way to know. (Another item is the hint of a peak around 20 – maybe real, maybe noise, a topic for another day). For questions #3 and #4 I’ll use one chart shown below. For this one I put the ACE values into buckets (0 to 2.99, 3.0 to 5.99, etc). The blue line is the as-is storm count data, which shows that the difference between 1925-1944 and 1988-2007 is largely concentrated in the weakest systems. This is not a surprise for those of us who think that improvements in detection of weak systems have played a major role in the increase in storm count. What if the Tiny Tims are removed from the modern period, to put things on more of an apples-to-apples basis? The answer to that is the dashed red line. The removal of Tiny Tims makes a remarkable reduction in the weak-storm difference. That’s the main thing I was exploring – the impact of the Tiny Tims. But, the curve also shows a tendency for the modern period to be somewhat more active at ACEs above 5. It’s my conjecture that some weak-to-moderate storms (5 to 10 ACE) in the remote eastern Atlantic were missed in the pre-recon era, due to the likely low density of ship traffic in that region in the Great Depression and WW2 era. There is also a possible issue with the extra-tropical classifications in the pre-recon period which I won’t get into here. Even with those, though, there still appear to be about 15 more strong storms (ACE above 10 to 15) in the modern era than in the pre-recon era. That’s 0.75 storms a year of moderate or strong ACE. Maybe that’s real and due to higher SST, maybe that’s real and due to a partial mismatch of periods, maybe it’s another measurement artifact, who knows. 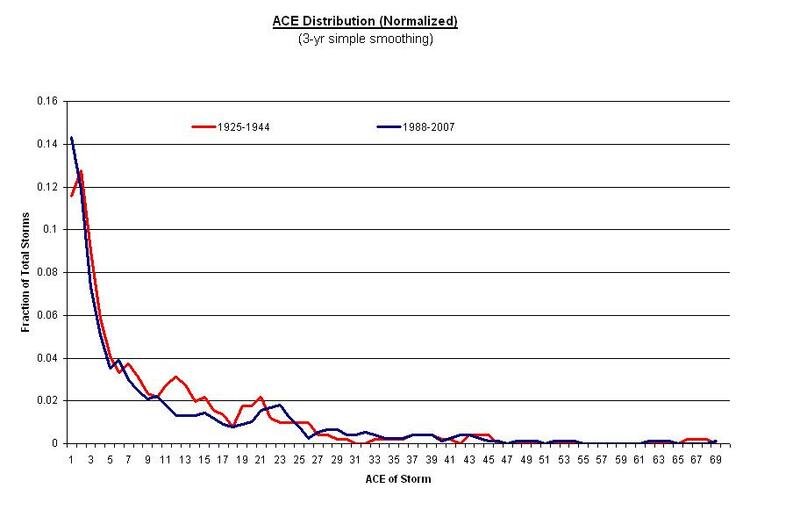 As mentioned near the start of this, historical ACE values need to be used with great caution as they were almost always based on best-guesses rather than measurements. The interesting thing to me in this exercise is the notable impact of removing the Tiny Tims in the fourth plot, which puts things more on an apples-to-apples basis. This entry was written by David Smith, posted on Dec 24, 2007 at 3:45 PM, filed under Hurricane. Bookmark the permalink. Follow any comments here with the RSS feed for this post. Both comments and trackbacks are currently closed. At first glance, it appears to knock the legs out from under claims that Atlantic storms are increasing in number and intensity — even if the .75/year is real, I’m not sure that it’s significant. Certainly warrants a closer look. I found an on-line resource that details the tracking of the six storms for the 1937 season via RDF (radio detection finding) techniques*. Any interest – Anyone? Bueller? *Actually, two coils in phase quadrature, using phase and magnitude of the arriving signal to display directly on a CRT the bearing to the source. Since ACE is a measure of intensity and duration what is the relationship between the two periods using just duration? Does the same relationship hold or is the duration of the storm more significant than the ACE in terms of detection for the TTs? It might be interesting to see both the duration distributions for all storms and for just the TT’s. I note you have “David Smith” in the title, but I don’t see a single reference to him in the body of the text. This would tend to be confusing to someone new coming here. Any chance of putting in an explanation? On #1 – the way the graphs are plotted makes it a little tricky to see the significant increase in big storms visually. 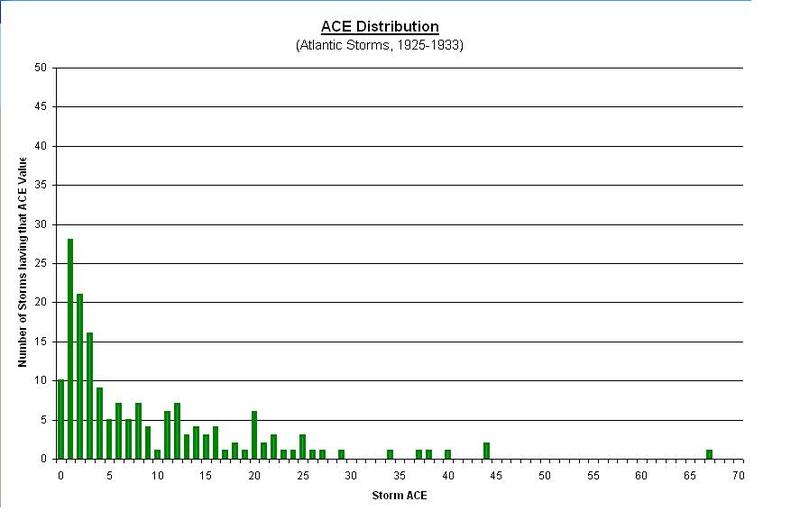 But just counting, I see with ACE > 30 there are 17 storms in the 1988-2007 plot, and only 7 in the 1925-1944 plot. Both cover 20 years, so that difference of ten storms is one large storm every two years. Sounds pretty significant to me. Also I don’t see where David got that difference of “15” in large storms. It looks like a difference of at least 20 in the ACE > 20 range from the graphs plotted here. You might cherry-pick a starting point to get a smaller number, but the difference looks pretty significant on this scale. Of course that may just mean the 1925-1944 peak wasn’t so comparable to the current one. The other question I have is whether the earlier data, in addition to losing the “Tiny Tims”, might have underestimated these ACE values. Do we have any handle on that? I don’t know what you mean by “remote eastern Atlantic” but in WWII there were established convoy routes out of Gibralter and Freetown, Sierra Leone. Lots of ships were lost off the North-East Coast of Africa. Also, your conjecture should be quite easy to test. I’m sure some of the Ports along the East African Coast have extensive records of merchant ship coming and goings during the Depression/WWII. It is hard to imagine that these numbers would have remained “thin” through WWII. 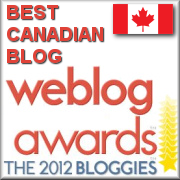 bigcitylib – you mean North West coast? Consider how the peak intensities of modern hurricanes have been measured. Most of the peaks where recorded with aircraft recon; a few with satellite estimates. 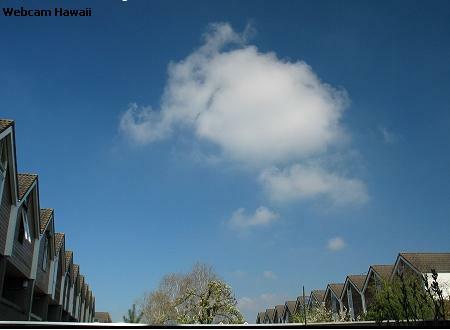 Without these observation platforms, could we have determined the peak intensities of Gilbert, Wilma, Rita or Katrina? Most likely we would have missed the minimum pressures of all these storms. They would have been recorded as large, strong hurricanes, but not as intense as we actually measured. Of the 4 category 5 hurricanes recorded before the aircraft era, 3 where recorded as cat 5 at landfall while the one remaining peaked less than two hundred miles east of the Bahamas. In the modern era, only 6 of 27 were category 5 as they approached land! The other 21 peaked over the open waters and were measured by aircraft and/or satellite. Is there any physical mechanism that would generate category 5 hurricanes only near the coast in the pre-aircraft era and mainly over the open ocean in the modern era? Of course not! Is it not much more reasonable to assume that the vast majority of category 5’s occurred over the open waters in both periods, and were simply missed without airplanes or satellites to detect them in the earlier period? There was also a strong incentive for ships to avoid storms, leading to both undercount and underestimate of strength. It’s a very interesting article. Happy Christmas. Tiny Tims are storms so weak, small, remote and/or short-lived that theres no record of ships or land experiencing storm-force winds, yet they were classified as tropical storms. By historical standards these modern Tiny Tims would have been regarded as depressions or disturbed weather, not tropical storms. Resuting in an apparent higher storm count. This is what happens when one plays with nomenclature and makes rule changes. The faciltiy I worked at for over 30 years counted only those injuries that resulted in lost time as significant, and the mill often celebrated milestones of 1,000,000 man-hours injury-free. Then OSHA changed the rules and required any injury – no matter now slight – that resulted in first aid (even a band-aid) to be counted. Now the place struggles to reach 250,000 man-hours. Funny thing, it’s actually a safer place to work than it was 30 years ago, but the “Incident Rate” is much higher. Re #4 Hi Barry. I have not plotted duration for the two periods but I’m pretty sure that the records would show a longer reported duration for the storms in the modern period vs 1925-1944. In my opinion this is connected to a sudden eastward shift in the average longitude of storms (around 1945, the start of aircraft recon). Steve M and others have written about this ( link ). An eastward shift in the reported track likely translates into longer duration. The issue, much-discussed, is whether the shift was due to a natural shift or due to changes in sampling (recon) and record-keeping. Regarding storm duration, the Kossin Vimont (2007) paper has an interesting Figure 1 . This shows trends in storm count, duration and intensity since 1950. On the TTs, I suspect that duration is more important because short-lived storms have little opportunity to expand their wind field. Here is a plot of TT duration. I don’t have a similar plot for all storms but will see if one is available. If this doesn’t answer your questions please let me know. Sorry about any confusion, fellows, but as originally posted, the thread gave Steve McIntyre as author. I’m certain of that since I checked twice to make sure I wasn’t imagining it before I posted. Apparently it got corrected but no note made of it. Possibly it was in the process of being changed when I posted that. Anyway, my question wasn’t that I didn’t know who David Smith was, who has posted here often, but that it might appear that Steve was taking credit for something by David Smith and something should be done to make things clear. Or that a newby might come by and get confused. For some reason I can’t get the link to work. The first figure shows a time series of Atlantic SST observations. Note the sharp drop in observations associated with World War Two. Also, activity in 1925-1940 looks like about one-third or less of the activity in 1980, a pretty big density difference. Figure 2 is a map of sampling density covering 1900-1980. The red box is the well-publicized MDR, in which storm activity is concentrated towards its western side. The maps hows a ship route from Europe to South America but it also shows the large area of sparse sampling in the eastern tropical Atlantic. Re #6 Arthur thanks for the observations and questions. I agree with using “20” instead of “15”. As noted in the post, I would not put too fine a point on anything related to reported storm ACEs from 1925-1944, especially at the higher ACE values. Intensities were best guesses. There are several things Ill try to illustrate with some charts later this week. * The average ACE for 1925-44 was 81 and jumped to 112 for 1945-64. That corresponded to the shift from intensities based on best guesses to intensities based on aircraft penetration of the storm centers. 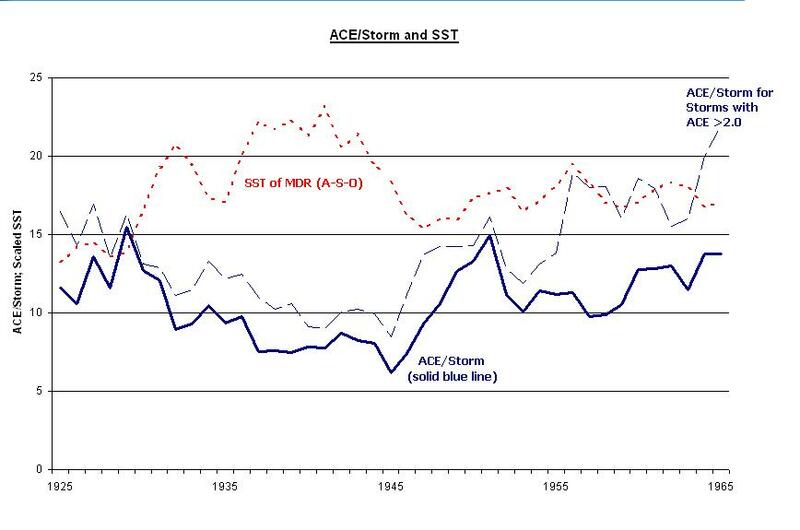 Regarding what might cause an increase in the ACE of large storms, here’s the GISS SST comparison ( link ), which shows not much temperature difference in the tropical Atlantic modern period versus the pre-recon period. I’ll quantify that at some point. 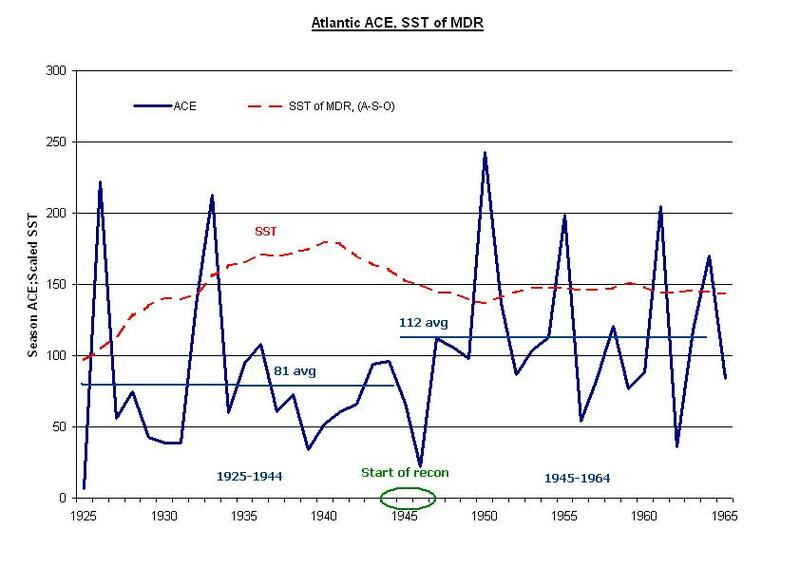 Also, the tropical Atlantic SST change from 1925-44 to 1945-64 was actually a decrease, yet ACE and ACE per storm rose. It’s a mess. Hi David thanks for the response. I haven’t had a chance to look at your references in detail and I really want to think about this before I bother you with any more questions. I did have a thought related to your post #19. When I looked at the second Sadler figure for SST counts that you referenced I was struck by the “hole” in the data off of the coast of Africa. It seems as if SST measurement counts could be thought of as a proxy for the probability that a ship would be in the area to observe a storm especially if you could get the counts based on the time frames you’ve been looking at. With the low shipping in the area off of Africa, storms that formed there would not have been detected till they moved westward or northward which would lower the measured duration for those storms. I would think it would affect the average measured intensity also. In extending the analogy of a Dickens Tiny Tim, I would like to present an exposition of Tropical Cyclones Detection Discussions (TCDD) Past, Present and Future at CA. Let us designate the current and well-articulated thread introduction by David Smith as TCDD Present. In the interest of doing what blogs sometimes do not do so well let us note some posts from TCDD Past to reinforce what David Smiths posts have been showing. For TCDD Future I would like to add another view some time soon in this thread on further evidence for changing detection capabilities for TCs over time and influential variables that can apparently override the effects that some have attributed to upward trending SST on TC counts, duration and intensities. For TCDD Past I would like to refer you to a couple of posts by Bob Koss on the YTD Hurricane Activity thread. At Post # 138 he shows the ACE index in two categories of storms from Land-300 miles and 301 miles-1100 miles for the time periods 1851-1902; 1903-1954 and 1955-2006. One can readily see that the Land-300 mile storms which should more readily detectable show a nearly zero trend over all time periods while the more distance storms show an increasing trend. In post #230 in the same thread, Bob Koss shows an ACE index split for -60 degrees longitude with the west side showing little or no trend and the east side an increasing trend. While these ACE differences correlating well with potential detection capability differences would seem to minimize any increasing trends over time for the NATL TCs with regards to duration and intensity, it would not address the issue of trending storm frequency over time. To that end, I would like to redirect you once again to David Smiths categorizing of what I like to call Easy to Detect storms that evolved in the thread YTD Hurricane Activity (specifically Post # 333) and other TC threads. Davids criteria these storms were that they were detectable from land (within 100 km) and islands and had a duration of more than 24 hours. Using that criteria we can compare the trends of the unadjusted TC (named storms) counts to the Easy to Detect storm counts. For the NATL and the period 1860-2007, Unadjusted storm counts trended at the rate of 3.6 counts/year per century with an R^2 = 0.16, while for Easy to Detect storms, the trend was 0.36 storms/year per century with an R^2 = 0.003. The trend differences over the time period 1900-2007 are even more dramatic with the Unadjusted counts trending at 6.3 storms/year per century with an R^2 = 0.22, while for the Easy to Detect storm counts had a trend of 0.0000 storms/year per century and with an R^2 = 0.0000. I would note that there’s a similar drop in observations in WWI. I suspect that given the level of naval operations there were possibly an increased number of observations but they are in military archives rather than civilian, also the introduction of the convoy system in both wars will have severely constrained the coverage. To my mind it makes no sense to include the war years (1914-18 & 1939-45) in the statistics, they should be treated as periods of missing data. Re #21 Barry, an example of a storm that emerged from the Atlantic “hole” is this 1944 storm which eventually tore up the US east coast. It was already a hurricane when it was first detected. During 1926-1945 fully 12% of the storms were first detected as hurricane (65kt) or near-hurricane (60kt) strength. These didn’t suddenly materialize from thin air – they were present as tropical storms but were undetected as such by the methods of the day. 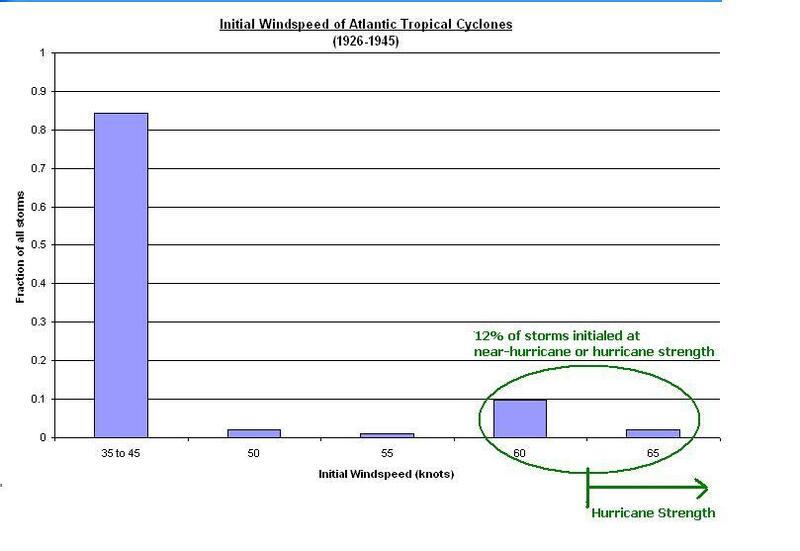 For 1926-1940, the percentage of storms at hurricane or near-hurricane strength when first detected was 10%. For 1941-1945, which was WW2 for the North Americans, the percent of storms first detected at hurricane or near-hurricane strength rose to 19%. To me that’s evidence that WW2 interfered with detection. For comparison, I expect that the 1988-2007 percentage first detected as hurricane or near-hurricane strength will be near-zero. The last Atlantic storm detected at 50 knots or more was Lili in 1984. For 60 knots you have to go back to 1957 to find Audrey. The analysis of ACE is flawed by a number of serious errors and inaccuracies in the statements supporting the analysis. The second period is 1925-1944, which immediately precedes the start of aircraft recon and has reasonably similar AMM/AMO characteristics to the modern period. Ill call this the pre-recon period. Aircraft observations of weather conditions long predates 1944. Balloons were used for obtaining air weather observations on limited occasions from the 18th Century onwards to the routine schedules of the 20th and 21st Centuries. Routine air weather reconnaissance flights were conducted during the First World War, with those conducted in response to German Zeppelin raids on England being one notable example. After the First World War, air weather reconnaissance was allowed to languish for a period of time, until the establishment of commercial air transportation networks and supporting radio communications networks in the late 1920s and 1930s. By 1935, Pan American World Airways began to establish a network of international airfields and airbases in the Americas, Pacific, and Atlantic, the airline also established supporting networks of weather stations to observe and forecast flight weather conditions and a network of radio stations to communicate the weather reports along with other radio traffic. Germany’s Condor airline, Italy’s LATA airline, British, and French services followed with the establishment of some of their own such networks. These commercial airline networks were particularly active in observing and reporting tropical weather conditions which could affect their operations and the interests of their nations during the period prior to the Second World War. Air weather observations were conducted by the aircrews while enroute between air terminals, and airline weather forecasters prepared a variety of weather products which included hurricane, typhoon, and tropical storm watches. The U.S. Army Air Corps (USAAC) — U.S. Army Air Forces (USAAF) and the U.S. Navy in the prewar period anticipated a need for air units dedicated to area air weather reconnaissance missions, but budgetary and procurement limitations denied them an opportunity to implement the concept until 1942-1943. Consequently, all air weather reconnaissance before the war and most air weather reconnaissance and air weather observations during the war were conducted by aircrews and weather/meteorological personnel aboard aircraft conducting other types of missions beside weather observations. With respect to air operations in the Atlantic Ocean region/s, air weather observations became ever more wider in coverage as the Allies extended the range and frequency of flight operations conducting anti-raider and anti-submarine warfare (ASW) air patrols and increased transAtlantic air transport flight operations. Those mid-Atlantic regions with gaps in coverage beyond the range of land-based ASW air patrols were finally closed with the deployment of naval hunter-killer ASW carrier task groups using naval carrier aircraft. USAAF meteorologists flew aboard regularly scheduled transAtlantic C-54 transport flights for the purpose of conducting air weather observations while enroute between the continents. Suffice it to note, there were extensive series of air weather observations conducted across wide areas of the Atlantic Ocean before the Second World War and throughout the Second World War by aircrews and meteorological personnel trained to lesser and greater degrees for conducting air weather observations while in flight. The advent of dedicated USAAF and USN air reconnaissance squadrons to conduct routine area tropical weather watches in the period 1942-1946 added to existing and extensive air weather reconnaissance capabilities instead of beginning them from nothing. Likewise, the Luftwaffe conducted air weather observations from a variety of military aircraft platforms engaged in weather reconnaissance and/or anti-shipping reconnaissance-strikes and from a variety of civil aircraft. This pre-recon period had only ship and landfall information for knowledge of the existence and strength of tropical cyclones. The above statement is simply wrong. The term “pre-recon period” is chronologically incorrect, wrong in claiming no air weather observations from air reconnaissance missions or other air missions, and misleading in wrongly claiming air weather observations did not contribute to hurricane weather watches or tropical weather watches before 1944. An extensive network of air weather observations from aircraft in flight existed and greatly expanded in coverage before 1944, particularly from 1935 to 1946. It also had what I describe as little more than educated guesses about a storms strength, mainly based on ship data which was often sparse and distant from the center of the stronger storms. The weathermen of the day were detectives, as are those who reconstruct storm history, and they made the best of what little data they had. Contrary to being “sparse and distant” as described, weather observations by aircraft and ships in the Atlantic Ocean were more frequent and greater in coverage over the Atlantic Ocean than any time prior to the Second World War and for awhile in the postwar era. The principal difference between the postwar era of weather reconnaissance and the prior years was the narrow focus of special efforts to observe and research hurricanes and typhoons with specially trained and equipped hunter-tracker aircraft. It wasn’t until 1943 that Joseph Duckworth piloted an aircraft with military meteorologist abord into the eye of a hurricane, and it wasn’t until 1946 that a B-29 equipped for weather reconnaissance conducted a research flight over the top and ito the eye of a hurricane. In the immediate postwar years, weather observations from ships and aircraft actually declined sharply quantitatively, but the special units focusing on tropical storm (hurricane) watches improved qualitatively. Given the extraordinarily vast quantitative and qualitative improvements in coverage of Atlantic weather conditions by ships and aircraft between 1935 and 1944, why are these massive weather networks being falsely reported and depicted as being “sparse and distant” in denial of their unprecedented transoceanic scopes? Given the extraordinarily vast quantitative and qualitative improvements in coverage of Atlantic weather conditions by ships and aircraft between 1935 and 1944, why are these massive weather networks being falsely reported and depicted as being sparse and distant in denial of their unprecedented transoceanic scopes? I suspect it’s because in both wars the data went elsewhere and simply has not been recovered unlike the civilian data? I suspect its because in both wars the data went elsewhere and simply has not been recovered unlike the civilian data? The National Climate Data Center (NCDC) has several datasets of surface and subsurface marine data which span periods from the 18th Century to the present with something greater than 180 million observational records. The metadata descriptions for some of these datasets span the periods of the First World War and the Second World War without mentioning whether some or all of the records during the war being absent. Consequently, it is presumed until proven otherwise that the marine surface observations are likely to ba available in those datasets. Japanese marine weather observaitons are also listed in the datasets. Since we don’t know what datasets were and were not used to compile the ACE charts, we have no way of determining whether or not relevant datasets were neglected and omitted or which datasets need to be corroborated for “sparse and distant” data. In any event, the depiction of no air weather reconnaissance and sparse ship traffic is erroneous and invalid. Although convoying did have an effect upon potential reporting patterns, those reporting patterns could and often did have in some instances the reverse effect than what has been assumed to be a decrease in tropical storm observations. German anti-shipping U-boat operations and Allied ASW operations often resulted in operations occuring outside the customary peacetime shipping lanes and inside areas subject to mid-oceanic tropical storm and hurricane activity. During the wars, weather service communications were classified as secret communications and transmitted as coded messages. We need to know which datasets were used to compile the ACE statistics, and the extent to which the datasets used are more or less representative of the wartime record of weather observations. Re #26 Hello, D, and thanks for your extensive post. I see an opportunity to learn from your knowledge, which is always a good thing. First, though, I’d like to narrow the focus to that which is connected to the topic at hand: aircraft reconnaissance of the tropical Atlantic, in particular the eastern portion (east of the Lesser Antilles), in the period 1925-1944. I have no doubt that airplanes and balloons made weather observations pre-1945 in many parts of the world, including the tropics. In fact, a relative of mine flew an observation plane in the American Midwest in the early 1930s, making weather observations for local radio stations. And I have no doubt that the North Atlantic between the States and Europe was well-monitored during WW2. The 1943 reference is to Duckworth’s flight. The summary listed one 1944 storm detected by a recon flight (which was searching for the storm based on surface pressure falls). Beyond that I think the military aircraft in 1944 were used to make fixes on known storms. Whether they played any role in estimating storm strength other than in this storm. I can’t think of any well-traveled 1930s or 40s commercial flight paths linking the US directly with Africa. There were likely commercial aircraft flying from Europe to South America, but I’m inclined to think that they stayed near land, perhaps Europe to New York to Miami to South America or down the west coast of Africa. Anyway, perhaps the way to make progress is this – do you have information on aircraft patrols or recon, or commercial flight paths, that covered portions of the tropical eastern Atlantic? Also, do you have information on storms detected by aircraft, as this would be a good indication of the effectiveness of the air coverage. I think there’s an opportunity here to build specific knowledge and a reference list at CA about aircraft detection of tropical cyclones prior to 1945 which would educate me and possibly others, which you can greatly help assemble. One and two show the distribution of initial windspeeds in the 1988-2007 and 1925-1944 periods. If a storm is not detected until it has 60+ knot winds then a portion of its track has likely been missed. Three shows season ACE and SST for 1925-1964. The horizontal lines are the ACE averages for the two twenty-year buckets. Plots are three-year simple averages. (Things to ponder) Is that a bump upwards about when recon began? What’s the relationship between MDR SST and season ACE? Four shows ACE/storm and SST for that same period. I also included a plot that excludes those with ACE below 2.0 (roughly equal to Tiny Tims). Same questions to ponder as listed above. I think you mis-processed your chart of initial wind speed 1988-2007. I don’t have the 2007 figures yet as I’m waiting for the 2007 best tracks file. The figures I have for 1988-2006 are much different. I find only 12 storms discovered at 35-45 knots. The remaining 232 storms during those years were all discovered between 15 and 30 knots. As I noted in comment #25, there have been no 50 knots discoveries since 1984. The other chart for 1926-1945 appears correct with one 30 knot exception on 10/10/1945. I just realized I processed 1926-1945 and you were doing 1925-1944. Just scratch the comment about the 30 knot storm. That chart of yours is correct. First, though, Id like to narrow the focus to that which is connected to the topic at hand: aircraft reconnaissance of the tropical Atlantic, in particular the eastern portion (east of the Lesser Antilles), in the period 1925-1944. Insofar as the aerial detection of hurricane activity and tropical storm activity in the mid-Atlantic Ocean and South Atlantic Ocean for the period from 1935 to 1944 is concerned, you do not have dedicated air weather reconnaissance units conducting area weather reconnaissance patrols in the tropical Atlantic Ocean regions. Such air units did not yet exist. Instead, you have USAAF and USN ASW aircraft and aircrews reporting weather observations in their areas of operations. Instead you have USAAF Air Transport Command (ATC) aircrew and commercial airline aircrew enroute weather observations. Instead, you have German Luftwaffe Focke-Wulf FW-200 Condor long-range maritime reconnaissance patrol bombers performing anti-shipping reconnaissance and weather reconnaissance over the North Atlantic and South Atlantic. Instead you have USN and RN carrier task group air weather observations in their operational areas, particularly the ASW carrier task groups. Between 1 September 1939 and 7 December 1941, you also had U.S. Coast Guard (USCG) cutters/ships serving as weather ships and radio navigation beacons for transAtlantic and intraAtlantic flight operations. [….] And I have no doubt that the North Atlantic between the States and Europe was well-monitored during WW2. Actually, the North Atlantic was not well monitored during some of the winter months because the weather was severe enough to bring most flight operations to a halt and all transport and ferry flights to a halt. The 1943 reference is to Duckworths flight. The summary listed one 1944 storm detected by a recon flight (which was searching for the storm based on surface pressure falls). Beyond that I think the military aircraft in 1944 were used to make fixes on known storms. Whether they played any role in estimating storm strength other than in this storm. You are reading too much into the quoted passage. The quote is referring to the activation and initial operations of the USAAF 1st Weather Reconnaissance Squadron (Test) proposed on 6 May 1942 and began operations 9 August 1943. This was the first air unit of the USAAF to be organized, trained, equipped, and dedicated to the performance of area weather reconnaissance missions. This unit was preceded, however, by other route weather reconnaissance missions performed by air units not organized, trained, and equipped for such missions. During the movement of fighter air combat units of the USAAF Eighth Air Force from the United States to Great Britain in OPERATION BOLERO in the summer of 1942, a number of weather reconnaissance flights were used to safeguard the routes used by the fighter aircraft and their bomber escorts. Due to a high rate of losses due to weather on the North Atlantic route in the winter of 1942-43, air traffic was halted for some months. When flight traffic resumed on the North Atlantic route in April 1943, three B-25 Mitchell bombers were assigned to perform weather reconnaissance patrols along the North American coasts, and three B-17 Boeing Flying Fortress bombers were assigned weather reconnaissance patrol areas 500 to 800 miles off the coasts and into the Atlantic. These early weather reconnaissance missions served as intermediate steps to the development of the first purposefully organized weather reconnaissance squadron on 9 August 1943. When you reread your quoted source, “[…] brought the Hurricane Warning Service an excellent new tool […]”, note how the existing ” Hurricane Warning Service” was brought “an excellant new tool” to add to its existing old tools. In other words, the new weather reconnaissance squadron is an addition to the previous tools used by a hurricane forecasting service. Colonel Joseph P. Duckworth had nothing to do with the weather reconnaissance squadrons. He was the commanding officer of a training command for instructors for instrument flight training at Bryan Army Airfield, Texas. With a navigator in the backseat of an AT-6 Texan trainer, Col. Duckworth thought it would be a fun challenge to see if he could use instruments to fly through a hurricane and into the hurricane eye. After succeeding in reaching the hurricane eye and returning safely to the airfield, the base pilot-weather officer, First Lieutenant William H. Jones-Burdick asked Colonel Duckworth to do it again with him as the passenger, which he did. A brief article about their experiences were published in a service publication in August 1943, but missions by weather reconnaissance squadrons with hurricane hunter-tracker penetrations of hurricanes was not to begin until September 1945 when the 3rd Weather Reconnaissance Squadron (Medium) made its first penetration of a hurricane eye wall. I cant think of any well-traveled 1930s or 40s commercial flight paths linking the US directly with Africa. There were likely commercial aircraft flying from Europe to South America, but Im inclined to think that they stayed near land, perhaps Europe to New York to Miami to South America or down the west coast of Africa. The South Atlantic air route was principally located between Brazil and West Africa. In Brazil, German, French, British, and American landplane and seaplane air terminals were located at places such as Amapá, Belém, Sao Luiz, Camocim, Fortaleza, Natal, Recife, Maceió, and Bahia. In West Africa, the air terminals used varied considerably with peacetime and wartime circumstances. In peacetime, Dakar was a favored locale. In wartime, Dakar was controlled by Vichy France and not available to Allied air traffic on the South Atlantic route until after the Allied invasion of French Northwest Africa and successful negotiations with the Vichy French governor-general of Dakar. Instead, the long-range aircraft on the South Atlantic route generally used Natal, Recife, or Belém to Accra or Lagos. Short-range aircraft had to make a stopover for refueling at Ascension Island. There was some air traffic to Leopoldville, Belgian Congo. Not only was the South Atlantic route an important transAtlantic route, it was the most heavily used air route in the world throughout the war. Until the opening of a new Central Atlantic route in December 1943, the South Atlantic route was the only available transAtlantic route during some of the winter months when the North Atlantic route was closed to air transport and ferry traffic spring weather in April. This means that all air traffic and aircraft ferry flights from the United States to North Africa, the Middle East, the Soviet Union, China, Burma, India, Australasia (until the Japanese conquests), and Great Britian during some winter months used the South Atlantic route. After Portugal finally allowed limited use of the Azores, a Central Atlantic route was opened in addition to the North Atlantic route and the South Atlantic route from 1944 onwards. Air traffic from the United States used the Southeastern route through the Lesser Antilles to reach air terminals such as Natal in Brazil. Pan American pioneered weather forecasting on the Southeastern route using the meteorologists of its Brazilian subsidiary, Panair do Brasil. In 1941, the USAAF established nine weather stations across the region including Puerto Rico, Panama, the British West Indies, British Guiana, and the Virgin Islands. By 1943, regularly scheduled route weather reconnaissance flights were being conducted along the Southeastern route. Anyway, perhaps the way to make progress is this – do you have information on aircraft patrols or recon, or commercial flight paths, that covered portions of the tropical eastern Atlantic? The coastal waters of Northwest Africa and Eastern Atlantic Ocean from about 14 degrees North latitude to about 35 degrees North latitude were for the most part off limits to Allied air traffic other than naval operations until about 1943, after the Allied invasion of French North Africa. The Vichy French forces, neutral Spanish territory, and neutral Cape Verde Islands served to bar access until the Allied capture of Vichy French territories opened Access to French Morocco and French Algeria. Before and during the Allied invasion of French North Africa, aircraft carriers ferried land-based fighter aircraft such as the Curtiss P-40 into the Eastern Atlantic and deck launched them at sea to land at West African and North African air bases. With the opening of the Central Atlantic route Miami-Bahamas-Azores-Marrakech in 1944, the risks of encountering tropical storm activity increased, and the new weather reconnaissance squadrons were assigned to patrol for the kinds of tropical storm activity you were reading about in the article you quoted. Also, do not neglect the contributions of the weather stations. Experimentation with sferics by five USAAF weather stations in the Caribbbean from 1944 demonstrated the ability to detect and locate bands of tropical thunderstorm activity by their sferic activity a distance of 2,000 miles. Also, do you have information on storms detected by aircraft, as this would be a good indication of the effectiveness of the air coverage. I think theres an opportunity here to build specific knowledge and a reference list at CA about aircraft detection of tropical cyclones prior to 1945 which would educate me and possibly others, which you can greatly help assemble. There are innumerable anecdotal stories of WWII era aircraft encountering dangerous storms, but very few with the specific details you are thinking about. The best sources to consult would be the NCDC datasets which give meteorological details along with aircraft positions in lat.-long. and Marsden squares. Re #33 Indeed Bob you are correct about the initial discovery at 15 to 30 knots (tropical depression stage). As I should have mentioned, I chose to use the initial storm strength (at least 35 knots) reading for the 1988-2007 storms, just in case the 1925-1944 data keepers had depression-stage data but chose to not include it in the official records. That errs on the side of understating the difference between the periods. Thanks for checking. If you get a chance you might post a bar chart which includes the depression-stage data. While D. Pattersons discussion about the details of actual and potential TC detection coverage in the past can be interesting and informative, eventually the direction of that discussion needs to get down to evidence for that coverage and explaining the differences in storms detected by ease of detection and location in the NATL that have been numerously sited in these TC threads at CA. 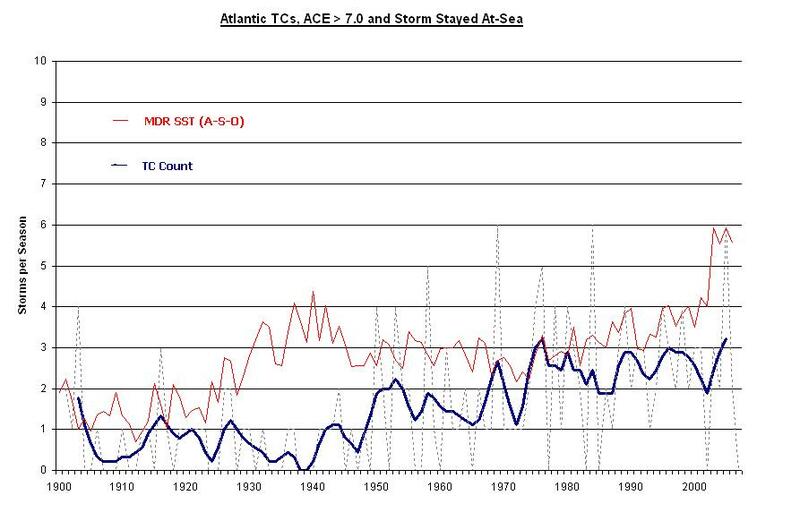 We have had the dumb ships theory handed down by climate scientists without any corroborating evidence and comments about the detection of past TCs not being substantially affected by lesser technical capabilities because the past counts contained both over and under estimates of the actual conditions. To me that is more wishful thinking on the part of those who would like to use the NATL increasing trends in TCs and TC properties to correspond to increasing SSTs without concern for any confounding of the effects of SST with changing detection capabilities. The paper goes on to list a number of published papers in which a conditional Poisson process is used in modeling an expected TC occurrence that is influenced by what they call state variables. Sabbatelli and Mann show in this paper that using the Nino 3.4 (a SST ENSO index) index and SST, the fit to a Poisson distribution increases dramatically on going from the unconditional Poisson calculations (i.e., not using Nino 3.4 or SST) to the conditional case where the storm counts years are separated by classifications according to favorable and unfavorable conditions by their scores for Nino 3.4 index and SST and a Poisson fit is calculated for each classification group. A three classification division can be used by extending the classifications to: positive, neutral and negative. In the case with more classifications, the data becomes sparse for doing chi square goodness of fit calculations on the separate classifications. This same limitation can be encountered when using shorter time periods for this type of analysis. David Smith had at this approximate time also noted and listed what I call Easy to Detect TC storm counts that might take some of the trending out of these counts over extended periods of time due to changing detection capabilities. Smiths Easy to Detect count evolved in the thread YTD Hurricane Activity  (see Post #333) and used the criteria of storm duration of greater than 24 hours and detectable from land, including islands, (within 110 Km). I found that these counts had little or no trend over the time periods of interest. I was thinking in terms of the SST trend being confounded with a trend in changing detection. As it turns out Sabbatelli and Mann used no detection corrections. To that end, below I report again results that were obtained by using total unadjusted TC counts and Easy to Detect storm counts with the counts classified according to a negative or positive Nino 3.4 index. 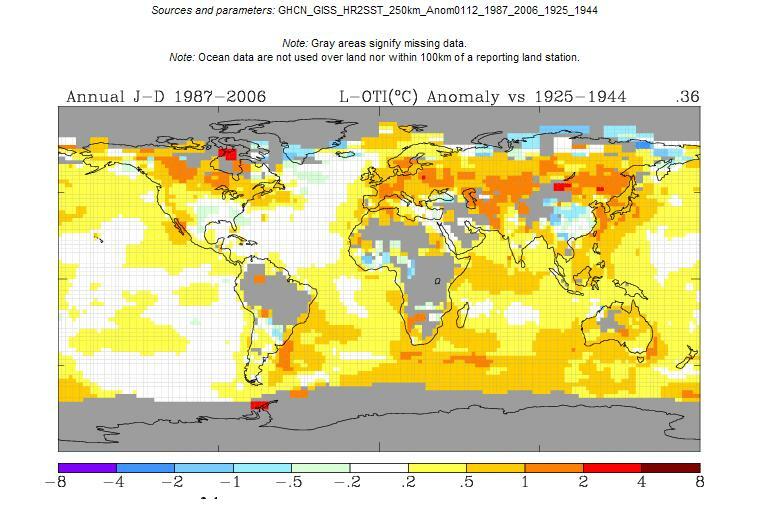 In the meantime in the paper Vimont and Kossin 2007 the authors use the Atlantic Meridional Mode (AMM) index that was claimed to be a good indicator not only for TC frequencies but for duration and intensities also. I added the AMM index (positive and negative) as a classifier for named storm counts, hurricanes and ACE. For ACE I assumed that the distribution should better approximate a normal distribution as the unconditional case was conditioned with the proper variables. I also compared the efficiency of using the AMM index versus using the Nino 3.4 index for fitting hurricane counts to a Poisson distribution and ACE to a normal distribution. I did the same calculations using several time periods and found essentially the same results. The results reported below are restricted to the time period 1900-2005. The Nino 3.4 index was based on the months ASO, while the AMM index was that used by VK which was for the months JASON. I would have preferred using ASO for AMM but that index was not available back to 1900. The p values reported below were for the chi square goodness of fit to the distribution noted. Easy Detect storms fit the expected Poisson distributions dramatically better than using the unadjusted total storm counts. The use of the AMM index for classification of Named Storm and Hurricane counts and the ACE index into two categories significantly improves their fits to their expected distributions, i.e. a Poisson and a normal fit. That the AMM index works better overall than the Nino 3.4 index for improved fitting is in agreement with the VK 2007 paper where they make claims for the AMM indexs effects on storm frequencies, durations and intensities. I judge that the significantly increased improvement in distribution fits from a simple binary (positive and negative) conditioning of the AMM index on the distributions is a good indicator that the storms are reacting strongly to the AMM conditions. In a separate calculation the AMM index was shown to be nearly trend less over the time period of 1900-2005 with an R^2 equal to 0.03 and the small indicated positive trend was not statistically significant with p = 0.10. The Nino 3.4 Index showed a completely flat trendline over the 1900-2005 time period. Regressing all years ACE indexes versus all years AMM indexes gave an R^2 = 0.33, while regressing years where the AMM index was negative versus the ACE index gave an R^2 = 0.09 and doing the same for the positive AMM index counterpart gave an R^2 = 0.11. The VK 2007 paper alluded to this phenomenon in their observation of other aspects of the relationship of the AMM index to TC properties in that the correlation is better overall than within the positive and negative classifications of the AMM index. I take from this observation that using the AMM index as a binary classifier is about as far as one can in obtaining improving fits to an expected distribution for TC counts, intensities and durations. In a near future post I want to show some changing trend lines for storm counts, hurricane counts and ACE index for various time periods that would be compatible with changing detection and measuring capabilities and look at Poisson and normal fits of de-trended data using the binary AMM classifications. 1. What is/are the source/s of the tropical storm counts used in the ACE analyses? 2. What are the potential ranges of error due to absent samples in the ACE analyses? Here are two charts showing the trend in initial detection and individual storm ACE values. I eliminated the subtropicals in the 2nd chart since they have no ACE value and are not recorded until 1968. The trend would have been down if they were left in. There is no trend to be seen in storm ACE. With notably higher initial detection speeds in the early record, it appears the trend in storm strength would be downward if the trend in detection speed was flat. David here are the bar charts for 1925-44 and 1988-2006. I don’t have 2007 yet. Data comes from the NHC best tracks database. The 2007 season isn’t available yet, as they do a data re-analysis after the end of each season. I believe ACE error in the early record to be significant, but hard to quantify. is consistent with the Sabbatelli mann findings. The longer -term question is, do your findings have any implications for the second Mann Sabbatelli paper ( link ). I’ll take a shot at that question myself after the New Year..
Re #40 Bob thanks for the plots. It looks like the reanalysis folks indeed excluded the depression-strength (30kts or less) initial wind reports in 1925-44. In the second plot, what is the y-axis? I think the 2007 ACE will be 68 to 70, depending on exactly how they reconstruct the wind estimates. Re #39 D the answer to #1 is the HURDAT database, which is reasonably presented at Unisys . On #2 I wish I knew the answer. There are many opinions. The y axis is the total ACE of the individual storms. Following, plot of 4th storm to occur during the 1937 hurricane season. Your source is a part of the early research which led to the study of sferics and a practical application of sferic networks during the Second World War to locate and track tropical storms. As mentioned earlier, the USAAF tried an experiment with a sferic network at five weather stations in the Atlantic-Caribbean. When this effort proved an ability to locate and track tropical storms in the Atlantic up to a distance of 2,000 miles away, the USAAF established another sferics network in the Central Pacific from May 1945 to locate and track tropical storm activity in that region. Sferics research and lightning detection networks continue to contribute to tropical weather watches and atmospheric research today. Thank you for the link. I was hoping for something new which disclosed the type and character of the primary sources used to compile the database. We’re unable to evaluate the completeness of the compilation so long as we cannot see a description of the sources and time periods they included and excluded. I recall the earlier discussions of Chris Landsea’s work with this data. However, I don’t recall seeing anything which described the primary records in enough detail to determine whether or not significant sources such as certain military, naval, and civil records may have been omitted during wartime and/or peacetime. Did I miss any such references, or were they not described? It’s disturbing to see the Sadler chart you linked with its wartime dearth of SST reports and then be unable to discover whether or not the data Chris Landsea was working with for the tropical storm counts does or does not have the same missing data for those time periods. It must be asked, can the storm counts from NOAA’s compilation of data sources be reasonably used to determine ACE while we still do not know whether or not the wartime datasets are included or omitted? Can the results be reasonably approximated, or would the potential omission of several years of data invalidate any efforts to estimate ACE for the North Atlantic tropical activity? D the main source I use are the season reports (and occasional individual storm reports) in the Monthly Weather Review archives .The farther back in time, the hazier the report. There are also notes from the committee that reviews the historical data. Check the links towards the bottom of this page . The introductory text indicates that they’ve worked up through 1914. I believe that Bob Koss found that the NHC has now added some storms in the early 20’th century. Jim that’s an intriguing paper. Do they give any indication as to how large/organized a storm needs to be to be detected by static? There are amateur networks built for just such purposes these days. In the USA they are mainly used for tracking tornadoes and thunderstorms. I was doing some research on low frequency response high impedance amplifiers a while back and came across it. Yes, and some of the sferics experimenters have Webpages illustrating their sferics lightning detectors. Given the experimental sferics networks, newly organized weather reconnaissance squadrons, radiosonde and radar observations, and proliferation of weather stations; it should not be surprising to see such large quantitative and qualitative improvements in tropical storm observations in the 1944-1946 time period. David, those are both good questions and I will have to go back to VK and SM (second 2007 paper) in order to give you intelligent answers. Perhaps my lack of a fast response will make me less suspected of snooping the data as that would be better done by someone with much more extensive knowledge of the science of TCs. By the way my original source of tropical cyclone data on counts, hurricanes, major hurricanes and ACE came from Greg Landsea’s web site and was updated with the past couple of years worth of data from anyone of the usual sources for this information. When I attempted to reach Landsea’s website yeasterday, I was not able to. I used an ACE of 70 for the 2007 season. When I attempted to reach Landseas website yeasterday, I was not able to. I used an ACE of 70 for the 2007 season. I was also getting the server not found error messages yesterday regardless of link from NOAA and elsewhere. Only the Unisys link provided by David seemed to give access to examples of the data. D., the two papers ( NHC 22 and Landsea (2004) ) give some general historical perspective on things and are currently accessible despite the NHC computer problems. There is also an interesting graphic in the Landsea paper related to storm size which I’ll post later. David, I just finished a quick read of the second Sabbatelli and Mann 2007 paper where they rehash the findings of the first paper and attempt to show that using Nino3.4 , AMO and SST they can demonstrate that only moderate undercounts in early history of TC would fit the model. They use these state variables to condition a Poisson model for TC counts in the NATL. The problem in my view with their analysis is that it does not consider the confounding of increasing SST with increasing detection capabilities for TC. What I did with Easy Detect storms and Total unadjusted storms analysis was to remove SST as state variable and show that the Poisson fit for Total unadjusted storms can be significantly increased using AMM index (and Nino 3.4 Index) alone. One can validly assume that using Easy Detect storm counts removes most of the trend due to changing detection capabilities. The Easy Detect storm counts have a very small to zero trend over time periods from 1860-2007. I must say that I get a chuckle reading the introduction to the SM paper and how they reference what agrees with their positions in these matters and what disagrees. They certainly do not simply state the results and conclusions of other papers. I am surprised that they do not ever mention that increasing SST and detection capabilities could be confounded. I have to go back over the VK 2007 paper to understand your point about AMM indexes potentially changing for Easy Detect versus Total storms. Thank you very much. Those are some of the documents I’ve been trying to access for awhile. I’ll comment more later. Ican already see the card decks did not include possible helpful elements from the ship logs. In a previous post on this thread Pielke Jr. noted that trends over time for TC counts can change precipitously depending on the start and end points used. That made me think what would those end points look like for in terms of positive and negative AMM indexes and could the index explain a reasonable portion of the trend. To that end I measured 55 year trends for hurricane counts, ACE index, total unadjusted TC counts and Easy Detect storm counts for the periods 1900-1955, 1910-1965, 1920-1975,1930-1985,1940-1995 and 1955-2005. I looked at the first 10 years and last 10 years of each period and determined the number of years in the start 10 years that had a positive AMM index and how many in ending 10 years had a positive AMM index. For completeness I did the same for the entire 1900-2005 period and also the period 1860-2005 (where AMM indexes were not available). I also included the overall averages for the above TC statistics and the averages for the years when the AMM index was negative and positive for the time period 1900-2005. All the calculations are summarized below in the table. If one assumes that the start and end years have significant leverage on the trends over these time periods then the proportional occurrence of the AMM index as positive (negative) in theses leveraging years can explain at least some of the trends and for all TC properties measured. It is rather obvious that the AMM index can be used to separate the higher and lower than average counts for TCs and hurricanes and indexes for ACE. I’d like to offer a couple of maps, which may be useful to people who are unfamiliar with the sizes of hurricanes. The first map ( link ) is of the Atlantic. 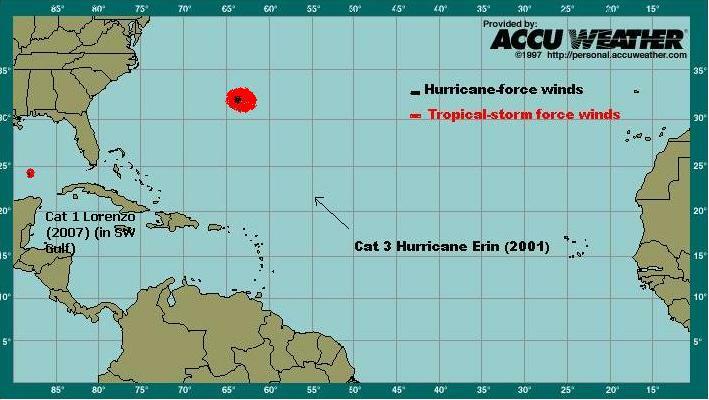 It shows the wind field of Hurricane Erin (a major (100kt) storm in 2001) and Hurricane Lorenzo (a barely cat 1 storm in 2007). 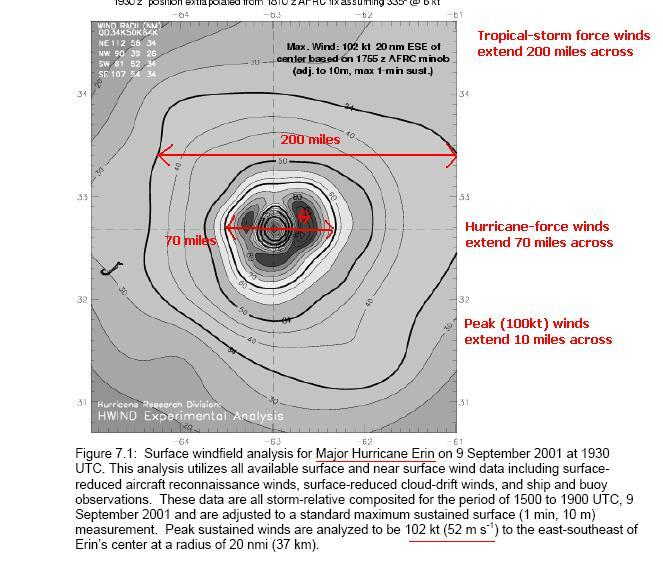 Erin’s windfield was available from the 2004 Landsea report and Lorenzo’s was pieced together from the storm report. Looking at Lorenzo, I think that one can get a sense of how such a small, short-lived storm could be missed in the era of ship-only reports, especially if it is in a remote region. 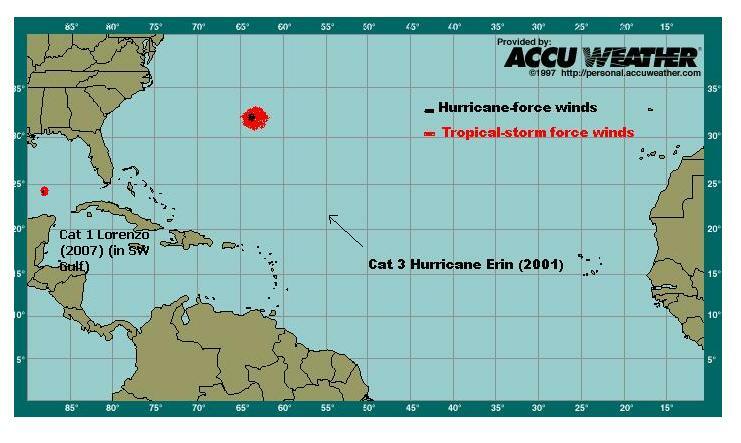 Erin is much larger but doesn’t exactly dominate the western Atlantic. I think the tropical-storm force winds would be detected by ship traffic but what are the odds of ships experiencing and reporting the highest winds? For that question I offer this map, from Landsea (2004) which is a closeup of Erin’s windfield and is based mostly on aircraft measurements. Note the modest size (about 70 mile diameter) of hurricane-force winds and the small size (about 10 miles) of the peak (90-100kt) winds. Re #57 The red microsoft paint spray windfield is fuzzy around the edge on the first map so here is a replacement map. David, I revisited the VK07 paper and found the comments relevant to your question about potential differences between the relationships of the AMM index to Easy Detect and Unadjusted Total storm. From the excerpt below we are told that the positive phase of the AMM favors the cyclogenesis of the more difficult to detect tropical storms  or at least detect them close to their origins. The second excerpt defines the detection problem as one more likely in the easternmost part of the Atlantic and then finishes with but the AMM offers a physical mechanism for the latter leaves me a bit confused to its meaning. Ignoring for the moment how much the genesis of longer lasting storms would confine them to their origins, the positive phase of AMM leads to more TCs and if the eastern part of the Atlantic is the suspect area of undercounts in past times and suspected because it shows fewer detected storm in the past then that would be an indication of an even larger undercount after consideration of the AMM index. After I have had a chance to think through more the VK07 comments, I need to look at the analysis I have already done to determine whether those results fit with the authors reasoning. The relationship between the AMM and genesis longitude offers a climatic feature that can contribute to the observed variability of hurricane activity in the eastern tropical Atlantic. There is presently some uncertainty regarding attribution for this variability, namely, that in addition to possible climatic influences, presatellite era observations may be more rarified in the easternmost parts of the Atlantic compared with the western regions. This is likely to lead to an underrepresentation of actual activity during the earlier parts of the historical best-track records (Landsea 2007). The relative contributions of data fidelity issues versus physically reconcilable climatic modulation to eastern Atlantic hurricane variability is presently an open question, but the AMM offers a physical mechanism for the latter. Finally I included the third excerpt because I think it does a good job of summarizing the reasoning of the authors that the AMM can effect not only TC frequency but durations and intensities. Recall that the positive phase of the AMM is related to an increase in storm duration (Fig. 1). This is physically congruent with storms that form farther eastward and equatorward, because storms in the Atlantic generally track westward (and to a lesser extent, northward) along the southern flank of the Atlantic subtropical high. The southeast shift moves the genesis location farther away from land, allowing storms to persist longer before making landfall or curving northward around the western edge of the subtropical high and into the hostile environment of the midlatitudes. This is dramatically demonstrated in Fig. 3, which shows the genesis locations composited by the five strongest and five weakest AMM years. During negative phases of the AMM, cyclogenesis occurs more often along the east coast of the United States, very near land, and often in the extratropics where nearby cold SST and strong midlatitude vertical wind shear create an environment that is highly unfavorable for either storm persistence or intensification. In comparison, during positive phases of the AMM, genesis takes place more often in the main development region (MDR; e.g., Goldenberg et al. 2001) that spans the basin between 10° and 20°N. This region is relatively free of large landmasses, is generally described by warmer SST and lower shear than the extratropics, and is usually conducive to hurricane persistence and intensification. .
By the way my original source of tropical cyclone data on counts, hurricanes, major hurricanes and ACE came from Greg Landseas web site and was updated with the past couple of years worth of data from anyone of the usual sources for this information. I could not raise Chris Landsea at Chris Landsea’s website either. Greg Holland, Chris Landsea, Greg Holland, Chris Landsea.. Thanks Kenneth. I like the AMM concept and think it answers many questions, but my sense, for whatever it’s worth, is that there’s a missing piece in this puzzle. Variation in Saharan wind and dust? Dunno. Here’s something I’ve pondered, trying to make sense of the data: when a seedling (wave) becomes a storm (cyclone) it experiences conditions which make it slightly swerve to the right (north). For example, if the seedling becomes a storm in the mid-MDR, it will slowly swerve to the right and likely pass north of Puerto Rico into the open ocean and never see land. So, in a positive AMM, the earlier storm formation would likely cause these early-forming storms to swerve into the open ocean and never see land. The same idea would apply to a warming eastern Atlantic in Greg Holland’s scenario – the warmth may lead to greater activity in the MDR but this earlier development would start the swerving process earlier, moving the “extra” storms out to sea. There are lots of wrinkles that need ironing. What has been shown and referenced in this thread is that in the NATL the counts and ACE Indexes of the more easily detected tropical cyclones (TC) have shown little or no increasing trends over the past 100 plus years. In contrast to these trends, the trends for the total unadjusted TC counts and ACE indexes have shown an increase over the same time periods (and an increase that has been attributed by a number of climate scientists as indicating a connection with the concurrent increases in SST). By itself this difference would tend to indicate a changing detection and measuring capabilities for NATL TCs occurrences and properties over the time period analyzed. On the other hand, if one can show that all the increases in counts and ACE indexes were confined to the more difficult to detect TCs and also at the same time demonstrate why the easier to detect storm counts and ACE indexes did not increase, then one could make a case for a diminished influence of detection/measurement capabilities in favor of this discovered climate phenomenon operating rather exclusively in the area where TC is the most difficult to detect. When the annual differences between Total and Easy to Detect TC counts (Total-Easy) are plotted over the time period 1900-2005 one finds the overall trend in the difference to be increasing at a rate of 0.60 counts per decade. The trend is nearly flat for the time period 1900-1944 but with the total counts being between 1 to 2 counts more than the Easy Detect counts. In the time period 1945-2005, the trend of the difference increases to 0.86 counts per decade. These observations appear in agreement with changes in detection capabilities and particularly so for the break point in the mid 1940s. The continuous increasing trends into the 2000s may be surprising to some. One could yet conjecture that the pattern shown could fit that for increasing number of TCs in the harder to detect regions that began in the period around the mid 1940s. Total Counts Percentage Change for AMM negative = 6.6% per decade increase. Total Counts Percentage Change for AMM positive = 5.2 % per decade increase. The total counts as noted previously are larger for the AMM positive phase than the negative phase and thus the percentage change was used in the comparison here. Clearly the AMM index cannot be used in this manner as an alternative explanation to that provided by the increasing detection capabilities. Kenneth here are a couple of plots. 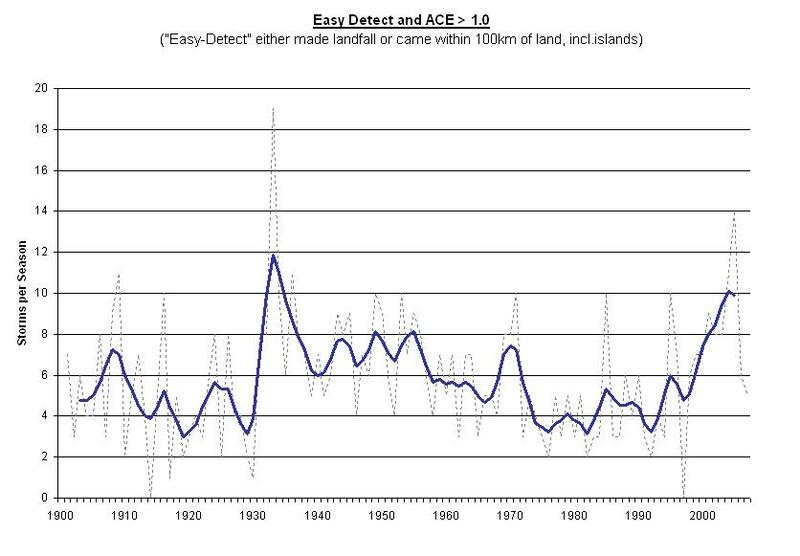 The first shows Easy Detect (those which made landfall or came close enough to land, including islands, to be reasonably detected) which had ACE greater than 1.0 (to eliminate the microstorm detection problem). 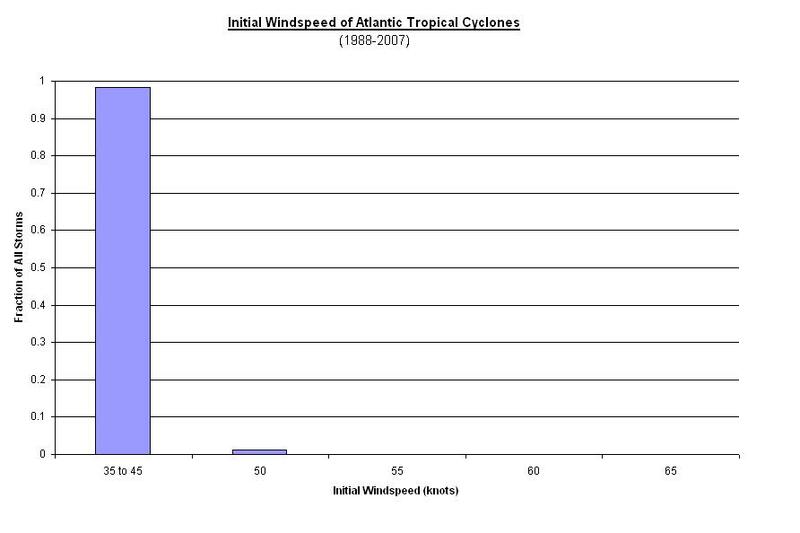 About 64% of all Atlantic storms fall into this category. To me this plot shows orderly behavior (well, as orderly as storm count can be) with a clear AMO pattern, but no trend. 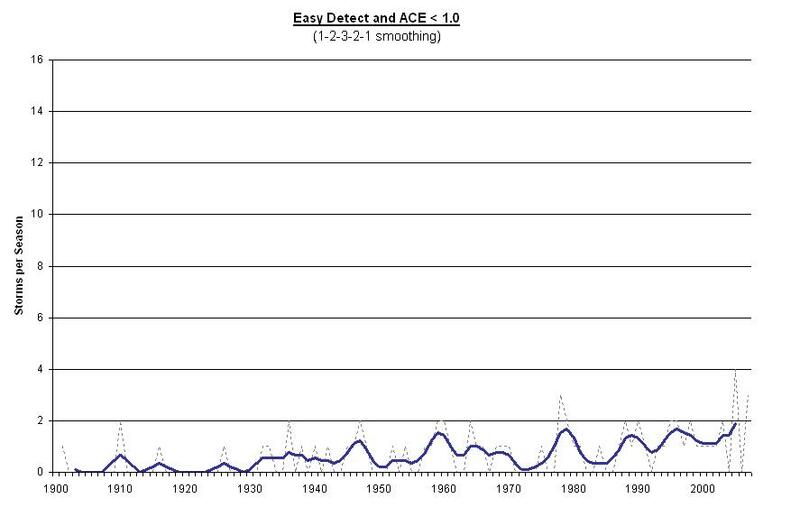 Next is this plot of Easy Detects with ACE less than 1.0 . These are the more difficult to detect microstorms. The pattern is an uptrend, consistent with improving detection methods. I’ll do the same split via ACE for the “Hard Detects” (those which stayed away from land) shortly. 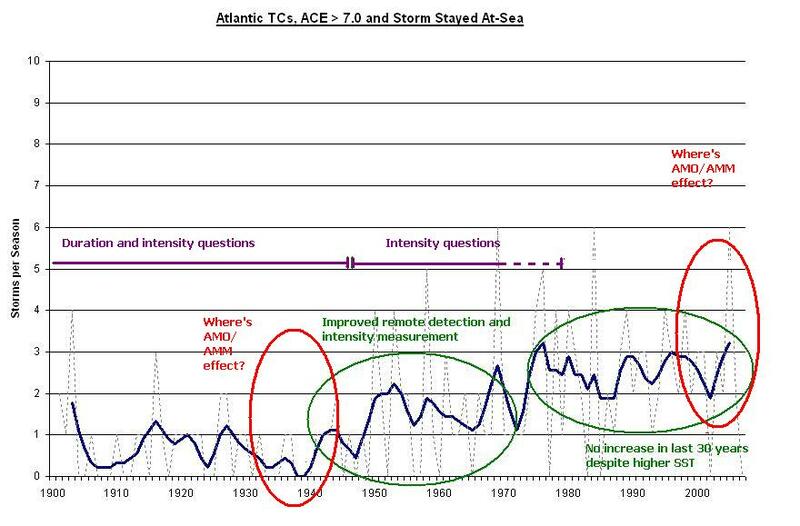 David, am I correct in assuming that the second plot linked excludes those TCs that did not make landfall or track within 100km of a the shore line or an island and that, therefore, the difference in the plots is the ACE criterion. Re #65 Kenneth that is correct: the only difference in the plots is the ACE criterion. Even in the Easy Detects, there is a small group of very weak systems which has grown over the years. In earlier years their brief, small excursion into tropical storm strength was undetected or ignored. Many of these microstorms occurred in the Gulf of Mexico (Barry, Erin and (arguably) Lorenzo are 2007 examples) which is now dense in detection means and where there is a desire to err on the side of overcaution due to proximity to land. Re #66 Thank you, sir! I’ll be Spreadsheeting while watching (American) football today, which is a dangerous combo. Here is a time series of Atlantic storms which (1) stayed at-sea their entire existence and (2) also had a recorded ACE of at least 7. These are the stronger storms of a group which, more or less, existed in the eastern and middle Atlantic. I included the SST of the MDR (red line) for comparison. If there’s a SST/storm count relationship it is anything but direct. Of more interest, though, is the apparent lack of an AMM/AMO impact on the storm count. On this marked-up plot I’ve circled (in red) the periods of interest. I expected to see, in the 1930s and 1990s, an upturn in storm count similar to the 1930s and 1990s pattern on this earlier plot . No upturn in those periods – why no upturn? The plot also has green and plum-colored comments to note that historical ACE calculations may have duration and intensity problems, which would affect the screen I used. More importantly, for the last 3 decades in which duration and intensity have been reasonably measured, there is no increase in the eastern/central Atlantic storm count of these stronger storms (ACE 7 and above). David, since I have been using your original criterion of landfall/near landfall and duration of at least 24 hours for my Easy Detect storm category, I wanted to see how it compared to your criterion that was the same for landfall/near landfall criterion but used ACE greater than 1.0. I found a few years have slightly different numbers and usually differing by 1 count up or down. Using either criteria gives a very flat trend line of 0 TC count increase per century for the period 1900-2007 while the unadjusted total counts show an increasing trend between 5 and 6 counts per century over the same time period. Your differences between storm counts of ACE less than 1.0 and equal to or greater than 1.0 shows a gradual trend upward much the same as when I plotted total counts minus Easy Detect counts over the same time period. I believe I have only seen Landsea address this issue of recent year sensitivity increases to naming TCs, but that has to be a significant part of the recent trend. I also think that the gradually trending upward of total TC counts due to what apparently are increasing detection capabilities and/or sensitivity to naming TCs is what allows it to be more easily confounded with SST increases, but nonetheless I should do more analyses in that direction. Combining these count analyses with the Bob Koss analyses of ACE indexes (showing at Post # 138 in the thread YTD Hurricane Activity that for the ACE index in two categories of storms from Land-300 miles and 301 miles-1100 miles for the time periods 1851-1902; 1903-1954 and 1955-2006 one can readily see that the Land-300 mile storms which should more readily detectable show a nearly zero trend over all time periods while the more distance storms show an increasing trend and in post #230 in the same thread, Bob Koss shows an ACE index split for -60 degrees longitude with the west side showing little or no trend and the east side an increasing trend) provides strong evidence that increasing detection capabilities and naming sensitivities leave little room for increasing SST having effects on storm counts, durations and intensities in the NATL over the past 100 plus years. What I find puzzling is the lack of recognition of any of this evidence by those climate scientists who would appear to be attempting to make a connection between these TC properties and SST. Mann and Sabbatelli can call the evidence of a flat trend line for landfall TC events for changing detection capabilities tenuous while at the same time with straight faces use the dumb ships theory to rationalize against any significant changes in detection and naming sensitivities. That I find amazing  but not surprising. That I find amazing  but not surprising. Maybe we should try to organize all of these different “slices and dices” of the data into one document, lest we (I) forget. I’ll get with you and Bob offline about this. I’ll be checking the graphs of #69 (probably while I again watch football) and may need to make changes. Home grown near Hawaii? Check. Likely to result in sustained 40 KT winds? Check. So, what would happen if this were in NATL instead of NEPAC? You know it baby, name it and claim it. Re #72 Steve S, I checked the Hawaii webcam and, sure enough, the hurricane is there ( link ). Looks like a monster by Atlantic standards. Are these storms called tiy tims all over the world or is this a US term ? Also can these storms be detected at altitude . I was watching a tv program on the Boeing 737 weather radar and the radar was picking up small pieces of weather that would normaly go unseen on the ground. Very interesting to look at the time comparisons that you have shown. Tiny Tim is a phrase used only here at Climate Audit, originally in an article written around Christmas. Ryan Maue uses the phrase Baby Swirls for these very weak microstorms. They are likely worldwide and rely on elevated sensing (satellites or recon aircraft) for detection. Obviously, prior to modern satellites and routine recon flights, they went undetected. One of the neat images of the tropics, a product of the satellite and computer era, is Earth moisture animation provided via Ryan. Click on the animation box. The red areas are those which have very high moisture content and are where tropical cyclones form (assuming other things are favorable). This type of technology has to have greatly helped forecasting in the tropics. Regarding the animation, it’s important to note that the type of projection used greatly exaggerates the size of the polar regions. The tropics are considerably larger than the image indicates. One other note on the animation – the intertropical convergence zone (ITCZ) is the irregular string of red (high moisture, thunderstorms) which moves east to west near the equator. I’ve wondered what happens if, for some reason, the ITCZ has a net shift southward, such that more ITCZ moisture passes into the Amazon Basin and towards the Andes. Perhaps orographic lift and the daytime heating cycle wring more moisture (heat) from the ITCZ. That would cause warming of the troposphere but also remove heat from the ocean, similar to El Nino. Perhaps that enhanced cooling of the ocean slowly, ultimately cools the planet, as in an ice age. Thanks for the link to Ryan’s video, David. Watching the humidity swirl across the globe put me in mind of an experiment in fluid dynamics I’d seen in a video on Friday. Please take a look at it, here. It shows the patterns that emerge in fluidized beads inside a rotating box. Watch for the connected whorl patterns that emerge half-way through, when the rotating box is made nearly full. They look very much like the humidity convection gyres that rotate across the globe. The authors note that the physics of this phenomenon is not explained. But it sure looks relevant to atmospheric physics. Thanks for the link, Pat – that is one intriquing experiment. It’s remarkable how counterintuitive reality can sometimes be. Imagine if heat transfer was involved. A small change in one aspect would create a huge change in energy movement, something that would be unexpected and unexplained. Agreed, David. It’s an amazing and instructive example of unexpected scale-dependent self-organization, emerging from purely chaotic motion. It’s probably unpredictable in the sense that it’s discontinuous, and even if one had the equations, you’d need to explore the numerical landscape before finding that behavior. You’re sure right about heat transfer. One could see systems evolving suddenly into new regimes of energy allocation. We can even suppose that climate micro states evolve that way. The visual analogy is striking.